For other uses, see No Man's Land (disambiguation). 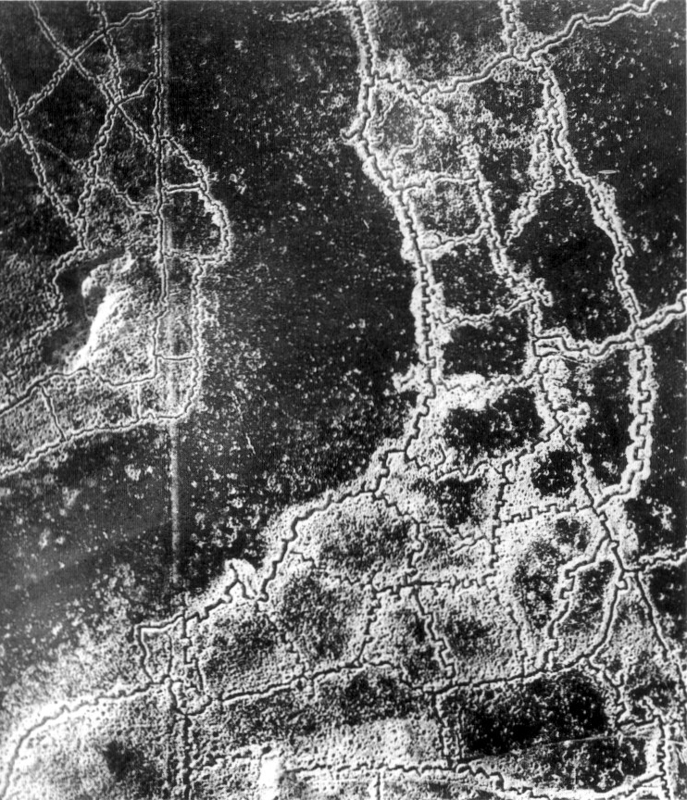 An aerial photograph showing opposing trenches and no-man's land between, during World War I. No man's land is land that is unoccupied or is under dispute between parties that leave it unoccupied due to fear or uncertainty. The term was originally used to define a contested territory or a dumping ground for refuse between fiefdoms. It is most commonly associated with the First World War to describe the area of land between two enemy trench systems to which neither side wished to move openly or to seize due to fear of being attacked by the enemy in the process. The Oxford English Dictionary contains a reference to the term dating back to 1320, and spelt nonesmanneslond, when the term was used to describe a disputed territory or one over which there was legal disagreement. The same term was later used as the name for the piece of land outside the north wall of London that was assigned as the place of execution. The term was applied to a little-used area on ships called the forecastle, a place where various ropes, tackle, block, and other supplies were stored. The British Regular Army did not widely employ the term when they arrived in France in 1914. The terms used most frequently at the start of the war to describe the area between the trench lines included 'between the trenches' or 'between the lines'. The term 'no man's land' was first used in a military context by soldier and historian Ernest Swinton in his short story The Point of View. Swinton used the term in war correspondence on the Western Front, with specific mention of the terms with respect to the Race to the Sea in late 1914. The Anglo-German Christmas truce of 1914 brought the term into common use, and thereafter it appeared frequently in official communiqués, newspaper reports, and per personnel correspondences of the members of the British Expeditionary Force. In World War I, no man's land was often ranged from several hundred yards to in some cases less than 10 yards. Heavily defended by machine guns, mortars, artillery and riflemen on both sides, it was often riddled with barbed wire and rudimentary improvised land mines, as well as corpses and wounded soldiers who were not able to make it across the sea of explosions and fire. The area was usually devastated by the warfare, carnage and remains of the artillery. It was open to fire from the opposing trenches and hard going generally slowed down any attempted advance. However, not only were soldiers forced to cross no man's land when advancing, and as the case might be when retreating, but after an attack the stretcher bearers would need to go out into it to bring in the wounded. No man's land remained as a feature of the battlefield until near the end of World War I, when open warfare became possible. During the Cold War, no man's land was the territory close to the Iron Curtain. Officially the territory belonged to the Eastern Bloc countries, but over the entire Iron Curtain there were several wide tracts of uninhabited land, several hundred meters in width, containing watch towers, minefields, unexploded bombs and other such debris. The U.S. Naval Base at Guantánamo Bay, Cuba is separated from Cuba proper by an area called the Cactus Curtain. In late 1961, Cuba had its troops plant an 8-mile (13 km) barrier of Opuntia cactus along the northeastern section of the 28-kilometre (17 mi) fence surrounding the base to prevent economic migrants from fleeing Cuba to resettle in the United States. This was dubbed the "Cactus Curtain", an allusion to Europe's Iron Curtain and the Bamboo Curtain in East Asia. U.S. and Cuban troops placed some 55,000 land mines across the no man's land, creating the second-largest minefield in the world, and the largest in the Americas. On May 16, 1996, U.S. President Bill Clinton ordered their removal. The U.S. land mines have since been replaced with motion and sound sensors to detect intruders. The Cuban government has not removed the corresponding minefield on its side of the border. The 1949 Armistice Agreements between Israel and Jordan were signed in Rhodes with the help of UN mediation on April 3, 1949. Armistice lines were determined in November 1948. Between the lines areas were left that were defined as no-man's-land. Such areas existed along the divided city of Jerusalem, and the fort of Latrun until 1967 Six Day War. ↑ 5.0 5.1 5.2 5.3 Payne, David (8 July 2008). "No Man's Land". Western Front Association. http://www.westernfrontassociation.com/great-war-on-land/battlefields/308-no-mans-land.html. Retrieved 20 November 2009. ↑ Hamilton, John (2003). "Trench Fighting of World War I". ABDO. p. 8. ISBN 1-57765-916-3. ↑ "Guantanamo Bay Naval Base and Ecological Crises". Trade and Environment Database. American University. http://www1.american.edu/TED/guantan.htm. Retrieved 2009-04-19. ↑ "Yankees Besieged". 1962-03-16. http://www.time.com/time/magazine/article/0,9171,940656,00.html. Coleman, Julie (2008). A History of Cant and Slang Dictionaries. 3. Oxford University Press. ISBN 0-19-954937-0. Persico, Joseph E. (2005). Eleventh Month, Eleventh Day, Eleventh Hour: Armistice Day, 1918 World War I and Its Violent Climax. Random House. ISBN 0-375-76045-8.